Each aviation accident investigation presents its own challenges and no two accidents or investigations are identical. Investigations have multiple phases and RJ Waldron is capable of stepping in at any phase of any investigation. RJ Waldron conducts complete investigations, from onsite investigations to the final report. Litigation support is also provided. Although no two aviation accidents are the same, RJ Waldron has 30 years of experience in quickly identifying, ruling out, and determining a specific cause or causes for an accident (such as a plane crash). This is done as quickly and as efficiently as possible. Failure is a term that is applied to a part or system that is completely inoperable, is still operable but cannot satisfactorily perform its intended function or has deteriorated to such a degree that it is unreliable or unsafe for continued use. Failure analysis is the process of determining the root cause or causes of a failure. 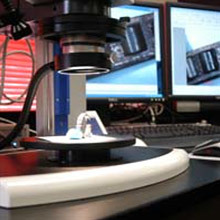 It is a process that involves physical observations, examinations, inspections, documentation and a variety of laboratory tests and techniques. It also involves reviewing the component or system service and maintenance history, collecting and analyzing data and reviewing information on prior failures. Failure analysis is a discipline that can stand on its own but it is also often a vital part of a complete incident or accident investigation. RJ Waldron & Co is capable of conducting failure analysis on most aerospace components and systems, including drive trains, engines, aerospace structures and aircraft avionics, hydraulic systems and electrical systems. Outside of aviation, incidents which have been investigated include numerous product liability cases, fire investigations, corrosion failures, oil tank failures, plumbing & construction defects, process failures, and bicycle related failures. A more complete list is available upon request. Accident reconstruction is the process of reconstructing an accident, including the attempt to identify, based on the best available evidence, the events which led up to the occurrence of the accident, as well as the attempted re-enactment of the accident. 1. 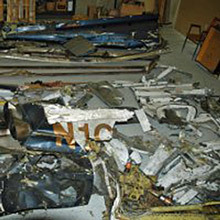 Reconstructing the wreckage in order to determine structural failures, attitude of the aircraft at impact, in flight breakup sequence and/or the severity of the impact. 2. Reconstructing the flight path, what occurred and/or what was said in the seconds, minutes or hours leading up to the accident from information sources that include flight data recorder readouts, cockpit voice recorder transcripts, ATC recordings and radar data and/or witness statements. In some cases, both types of process are required. RJ Waldron & Co has the experience and expertise to handle both categories.